I wanted to put the camera inside their heads. The Rider has us fooled. We’re set up for a western. Our hero looks like a cowboy, with the face of a young John Wayne and the demeanor of Gary Cooper with a badge. In his iconic white hat, crossing the plains on his white horse, he’s the “good guy” – the bad guys wore black. Or were they the “Indians,” who lined the jagged mountain ridges armed with arrows and scalped their captives? We Americans do know our history of “home on the range,” as the ballad goes – the cowboy’s lament of loneliness as he rides through the Wild West driving cattle, rounding up mustangs, and living off the land with horse, lasso, and gun, sometimes even guiding a wagon train of pioneers over a rough passage or meeting up with U.S. Cavalry. And many a European tourist today longs to visit the land of the exotic Indians, to see a real teepee and painted faces in a war dance, smoke a peace pipe, or buy baskets, blankets and beaded moccasins. This is the lore of the nation’s West – “us,” the Anglos, and “them,” the redskins. And in front of us on the screen we do have a real cowboy. But along with his bandana, chaps, and boots with spurs, Brady Blackburn wears a feather in his hat. He may be known far and wide as a bronc rider, but he was born and raised on the Pine Ridge Indian Reservation. He and his fellow contenders at the rodeo are Lakota Sioux Native Americans – by national mythology, “the enemy.” They live in the Badlands of South Dakota, leaping over the campfire at night and praying to a Catholic God for their deceased and imperiled. Yet they are bona fide cowboys. The contradictions pile up. Brady is tough and rugged, self-reliant and brave as they come, yet he’s probably the most tender horse whisperer ever seen. Right away we see him pulling metal staples out of his own scalp where the doctors implanted a steel plate after a horse trampled him in a competition, so Brady is destined never to ride again. But that is all he wants to do – to ride again, feeling the wind hit his back, watching it flow through the grass in the American West. This fact might be all that we can be sure of in a film that surprises us from beginning to end, not just in the usual way that genres build suspense through plot developments, but in all the circumstances surrounding the creation and production of this motion picture, and in how those choices play out in what we see and hear. Behind the scenes we learn that the film’s writer-director-producer is not some strapping Hollywood hire or even an American independent delivering another revisionist shoot-’m-up on prairie turf, but a diminutive female filmmaker born and raised in Beijing, educated in London and New York. So then again, we might expect her to shoot right through the old myths of the celebrated Manifest Destiny, and its manhood to boot. Does Chloé Zhao do this? Yes, and no. While she attended Mount Holyoke, a liberal arts college for women in Massachusetts, and declares herself a feminist, she also majored in Political Science, and claims her studies led her to Native grounds where she researched and made her first feature film, focusing on a young male Lakota teen in Songs My Brothers Taught Me (2013). She could easily have alluded to Sitting Bull and Crazy Horse, Custer’s massacre in 1873, the seizing of reservation land for the Badlands Bombing Range/Pine Ridge Gunnery Range beginning in 1942, the occupation at Wounded Knee in 1973 and the “Reign of Terror” at Pine Ridge, but for Chloe Zhao that history is today, evident in Lakota poverty beside rituals of both faith and abandon. Another filmmaker might focus directly on the fact that land sovereignty has been at risk at least since the “guarantees” of the Fort Laramie Treaty in 1851, that the average annual income in Pine Ridge is $2,600 compared to America’s average of $40,000, or that young Native men in South Dakota die from suicide at a rate four to five times the national rate, or that. Instead Zhao gives us the sad, lyrical evocation of these grim facts as Brady twirls his gun in the air while he rests face-up in bed, gazing at a single feather spinning overhead next to bottles of pills on his bed stand, or as the landlord of the family’s trailer home automatically helps himself to whatever there is in the refrigerator when Brady’s dad has left no rent for him yet again. Then it’s no wonder that Brady and his sister Lilly and all their friends treasure the land like devotees, savoring the vast plains even as storm clouds cross them, because portentous as those drifting clouds are, Zhao soaks the land and skies with the reverie of magic-hour light. What interests Zhao is the light inside Brady and his family and friends, and these interior portraits are perhaps the most baffling of all, because as intimately as we get to know Brady’s circle, often through close-ups of their faces, our scope by necessity becomes wide-screen, and we discover not only individual life stories that are inconceivably far from their counterparts in old movie images but also a deeper relation to the American West than the one we may know. While The Rider still holds the land in awe, its heart goes out to those who struggle against its myths and against the realities that those myths have enforced. And while the character point of view of the film is decidedly male, revealing how men see, talk, and act in this milieu, there are females in the wings, mostly doling out caring advice to Brady for his recovery – a doctor who cautions him against riding again, an employment counselor who helps find him a temporary job in a vast all-purpose store, a female buddy who distracts him from the taunts of his cowboy cronies, and most of all his sister, Lilly, who pleads with him to be more careful. The way she expresses herself to him – singing a lullaby to lure him to rest, decorating him with stick-on stars as he lies in bed, watching the sun set with him on the open plains – is the way we soon discover that she is autistic and needs him to take care of her, which is exactly what Brady vows to do, and what he does. Yet what we discover at the same time is that these first-time actors are playing themselves, their own stories, real stories, that they scripted with the filmmaker from their individual lives. Each of them has a personal trauma to re-enact, and Zhao may be directing a film, but at the same time she works a bit like a therapist guiding the members of a psychodrama group as they role-play in presenting themselves, all the while investigating their lives and perhaps reaching new or deeper insight. 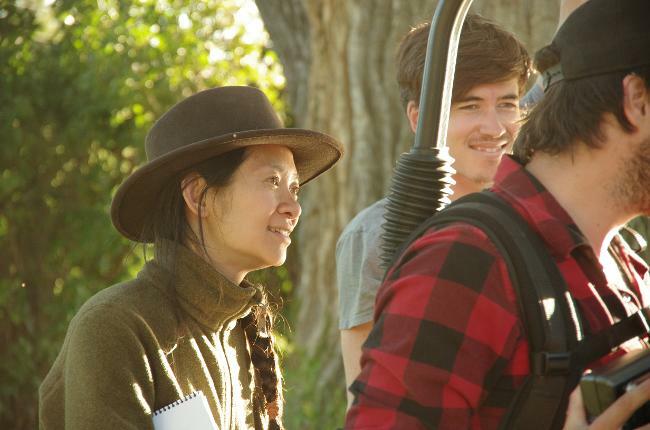 To do this successfully is one thing, but Zhao asked her participants to re-write their dialogue as they would speak it, and she has shaped the screenplay in a way that could be even more knowing or therapeutic than her cast members might have imagined because it feels at once so deeply true and so loving. Fifteen-year-old Lilly, in her stubbornness as she refuses to wear the bra her father buys her, is actually a foil for Brady in his defiant resistance to following “doctor’s orders” and staying off horses. Brady tries to coax Lilly into growing up properly as a young woman; maybe when he finds her cutting up the bra with a shears, he sees a picture of himself (even unconsciously) running off for a gallop on Gus before his father, Wayne, sells Brady’s beloved horse. “You’re stubborn like your mother,” Brady tells his little sister, but so is Wayne, who can’t resist the bottle and the slot machines even when the landlord comes to take over their trailer dwelling. “I can sell Gus,” he tells Brady, “He’s part of the family, and he can play his role and support us.” Brady succumbs to stocking shelves at Dakota Mart while all who pass by tip their hats to him as a rodeo hero, the best bronc rider around. It’s a reputation he can’t walk away from, but not because of the fame. Wayne himself, along with Brady’s mother, now deceased, taught him to ride. They sat Brady on his first horse when he was two weeks old, and horses have been his life. His name travels far and wide as a trainer, and while we may be watching Chloé Zhao train Brady Jandreau as an actor, watching him as Brady Blackburn training a horse is an unforgettable experience. The camera swerves with Brady and his equine charge – his alter-ego of the moment – around the tiny pen, the mustang at first bucking and resisting (a stubbornness we’re used to in this film); but slowly, as Brady talks and gestures to the horse, to make his presence known almost caressingly, with a body language not cunning but caring, the animal opens to the man and they become almost as one. We are there with them in the corral, in the mist of their trusting bond, never having felt the camera any more than they did. We see Brady facing many trials. He dodges the fact that he is in danger. Each time he rides or tames a horse, we cringe, because we know the cost, we feel the risk in gut-wrenching pain. What if this is the time Brady can’t open his hand to release the rope, given his chronic partial seizures? What if this time the horse throws him and tramples him again? We witness Brady’s numerous attempts to compensate for his setback. He shoots a rabbit and butchers it to take like a trophy when he’s a guest for dinner; he slugs a friend at the bar when the guy coaxes Lilly to drink a beer; he wrestles with young James, a kind of protégé, to the point of danger, to show his prowess, all the while he comes closer to confronting his own final defeat as a bronc rider. He tries to stave off this acknowledgement, but he can’t deny the loss of his horses, Gus and then Apollo, each one like a second self; these departures are surely all the more painful because they foreshadow Brady’s own loss of his life mission, his raison d'être, his very self. The saddest part is seeing Brady’s consciousness come to the surface when he goes to comfort his best friend, Lane Scott, the most famous bull rider in the whole region. Brady and Lane grew up together on the reservation, and their victory as riders is their identity as Native Cowboys. Just as all the other cowboys “spur” Brady on, telling him he’ll be riding in no time, he’ll “ride through the pain,” Brady says the same of Lane, even though when he visits Lane in a rehabilitation center after a bull trampled him in his last competition, Lane is confined to a wheelchair, uses sign language to communicate, and can hardly hold his body upright. Yet there is abundant spirit in Lane, and endless love from Brady. What is in some ways the biggest surprise is Wayne’s display of manhood in his final scene. A man whose wife has died and left him with two teenage children to raise – a son who escapes from the hospital after he’s had brain surgery only to return to the rodeo ring, and a daughter who has Asperger’s Syndrome – a man who is unemployed and down-and-out with money but who nonetheless taunts Brady to “cowboy up,” “grit your teeth,” “be a man,” this father must now insist that Brady do just the opposite. How can Wayne possibly expect to succeed in convincing his strong-willed son, whose only enemy is his father, the “low-life” role model Brady always rejected, to stand “down”? Chloé Zhao raises some hefty questions about manhood – or better yet, she coaxes them out of the men themselves, like a wise and knowing “horse whisperer” who crosses cultures, classes, and genders to show us how those borders need not fence us in. Director: Chloé Zhao; Producers: Chloé Zhao, Bert Hamelinck, Sacha Ben Harroche, Mollye Asher; Screenplay: Chloé Zhao; Cinematographer: Joshua James Richards; Editor: Alex O’Flinn; Music: Nathan Halpern, sound: Paul Knox and Ben Gieschen. Cast: Brady Jandreau, Tim Jandreau, Lilly Jandreau, Leroy Pourier, Cat Clifford, Tanner Langdeau, James Calhoon, Lane Scott, Terri Dawn Jandreau, Mooney, Peppy. Color, Widescreen, 103 min., in English.